Years ago in 1996 I was experimenting with some new mediums and ideas of how to artistically reorganize my thoughts into creating the next "Unusual Faces" concept painting. I had never really given much thought to the commercial side of the concept until I was introduced to a friend of my wife who urged me to go forward with this unique style of Art. In the beginning of my art career the sketches that I created were just fun to draw as I bent the odd looking character's faces way out of proportion and occasionally blended several heads into one. I guess that somewhere deep down inside of all of us there is a kid screaming to get out, who is poking fun of the thing's that they are not sure of how to accept. It was the Christmas season of 1996 and Aimee Meadows my wife's college friend told me that she had never seen anything quite so unique as these Unusual Faces before, and I think she wondered what I was really smoking besides cigars. They are sort of "Picasso gone haywire" she said. At that time I was not terribly impressed with her views of my Art, so I simply blew it off as scuttlebutt. Artists, when they first start out in their career are always trying to find inspiration inside of them selves. They are not sure what it is that they are trying to capture, and often they do not know how to obtain it. This was true about most of my conversations with Aimee. The years continued to roll along one by one and soon our friend Aimee had made her way into Harvard University to rediscover her self, just as I had found my new talent with the "Unusual Faces" paintings and sketches. Our lives take us on many a strange journey all in the quest of the unknown sometime, and you never quite know what it is that you are going to do that touches upon someone else's heart strings. Year after year I work in my cluttered studio like a Hermit who has surrounded himself with all of his precious possessions, and every day I look out the rear window towards the yellow and golden sunlight that streams in too reenergize my weakened mind. The trees out back are a lot bigger now than they used to be, and as time marches on my Artwork now comes to me with much more clarity than it used to in the beginning. I now have the ability to focus with greater detail on several projects at the same time that allows me to produce paintings accompanied by clever short stories. I think that the combination of the two adds a unique perspective so that the reader can realize what I am actually thinking about when I am creating another Art project. Some day, perhaps I will eventually publish all of these wonderful things in my Journals books when the time is right. In the meager beginning, my house was filled with all kind of strange and beautiful paintings, and now my paintings thank God are all over the country. It is important to remember where you came from, and it should always be with you inside of your heart in a safe place for keeping, no matter where your new roots will grow. With the Millennium just around the corner and Computers keeping us in touch in split seconds, even though Aimee has moved away in her forever searching to find herself life, I keep in touch by E-mailing her once in a while. Still I press forward with the faces paintings one at a time, and every single time I finish another one of those "Unusual Faces" I think of her, and how I almost gave up on these ridiculous conversation pieces. I remember giving her a rock for Christmas that year in her Christmas stocking. Can you believe that I gave her a rock? It was not your usual rock by any means I told myself, because inscribed on that rock was a phrase that I think will carry all of us to our awaiting destinies. The rock was inscribed with a simple word that said "DREAM". At the time when I gave it to her she was going thru a self doubt thing and I guess I thought it was appropriate. I thought the rock would help her believe in herself, just like she helped me to believe in myself. I don't know if I ever told her over the next few years "thanks for keeping me on track, and for having the insight to see what I could not envision at the time would be such a great idea. And if I have not told you already, thanks for being brave enough to speak your mind to me in the beginning, in the middle and hopefully until the very end. 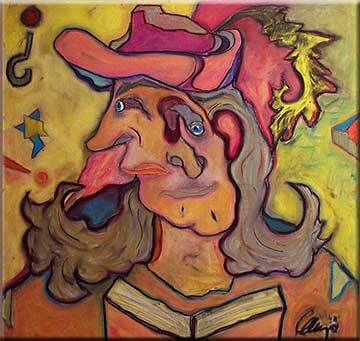 The newest "Unusual Faces" canvas entitled "Confused Columbus" that I have recently completed is 24x24 inch and is 3D. It is completed in Sennelier and Loew-Cornell Oil Pastels that have been hand rubbed into the canvas and then sealed with clear acrylic satin Gloss. It hangs in my GregoArt studio to this day on a golden nail right behind me. It is sad for me to realize that no matter how far away my friends move away from me, in my lonely heart I still realize that they are in the same room with me, because every time I look at a painting they enjoyed it reminds me of them to this very day. I will continue to send those deranged E-mails to you from time to time as we move farther and farther away. I wish you all the good luck in the world my friend, and good bye.